Who thought he heard Eli the priest calling him when it was really God? WHERE did we get Christmas?... from the Bible, or paganism? Here are astonishing FACTS which may shock you! Do you know the origin of the Christmas tree - of "Santa Claus," - of the mistletoe, holly-wreath - custom of exchanging gifts? Does Christmas really celebrate the birthday of Jesus? Was He born on December 25th? 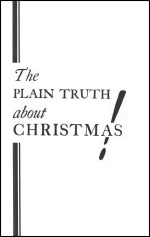 Did Paul, the apostles, and the early Church of the New Testament celebrate Christmas? Do you know what the BIBLE says about the Christmas tree? Stop and think! Very few know WHY we do the things we do, or WHERE our customs came from! We were born into a world filled with customs. We grew up practicing them, taking them for granted, but NEVER QUESTIONING WHY!